Gertrude Webb was born Goldie Mikels in 1916 and raised in Roxbury, Massachusetts. When she began school, her teacher changed her name to Gertrude, claiming that Goldie was 'too foreign." Gertrude was the middle of five children born to immigrants from Lithuania. She looked up to her older sister, who encouraged her to attend Girls' Latin School (a selective public school in Boston). After graduating from Girls' Latin School in 1933, Gertrude went on to the Teachers College of Boston, earning her bachelor's degree in 1937. During her first year of teaching in the Boston Public School system, Gertrude became attuned to learning disabilities when a bright student was unable to translate his ideas into writing. After her marriage to J. Chester Webb in 1941 and while home raising their six children, Gertrude continued her graduate education and earned a doctorate in education from Boston College. 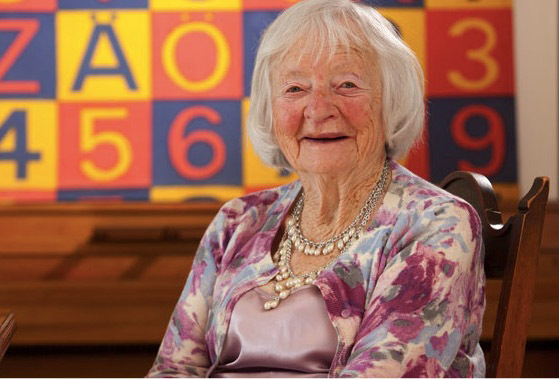 She also worked to create public awareness of learning problems, and founded the Massachusetts Association for Children with Learning Disabilities. After a twenty-year break from teaching, Gertrude’s husband encouraged her to return to the field. She went back full throttle, founding the first program in the U.S. for college-able dyslexic students, the Program for Advancement in Learning (PAL) at Curry College, where the Learning Center was renamed the "Gertrude M. Webb Learning Center." After her retirement from Curry College in 1993, she served as President of the Webb Innovation Center for Dyslexia, and continued to speak and conduct teacher training sessions around the world, as she was sure her husband, who predeceased her by ten years, would have wanted her to do so.